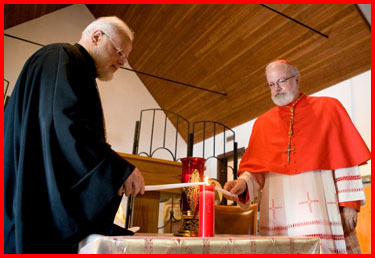 On Aug. 30, I bestowed the Knighthood of St. Gregory on Tom Flatley at a Mass held at the oblates near his home. 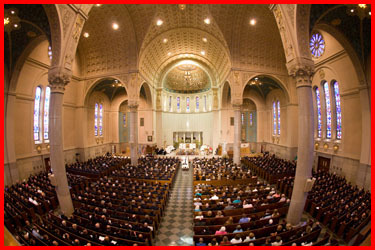 The Archdiocese of Boston is very indebted to so many very generous benefactors. Obviously, some of the people that give to us are like the widow in the Gospel, who having very little, still gives very, very much. Tom Flatley is an Irish immigrant who came here with practically nothing and has been tremendously successful in his business ventures. He is a man who has used his wealth to help so many. 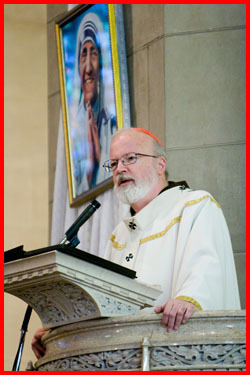 Our recognizing him is not something that he was looking for but something that we need to do as a Catholic community. 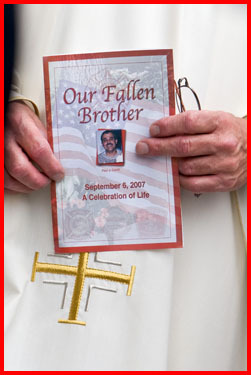 We need to be able to say thank you, to thank God for his generosity and to offer prayers for Tom and his beautiful family. 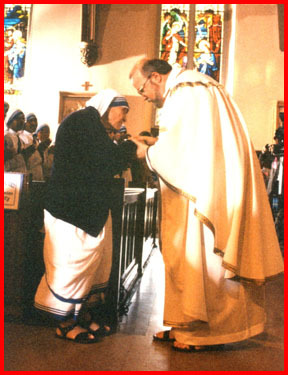 Wednesday was the 10th anniversary of the death of Blessed Mother Teresa of Calcutta. 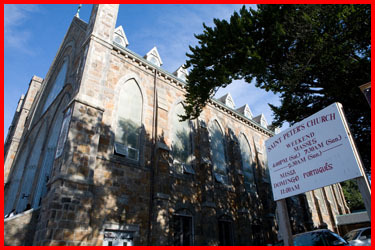 We had Mass at St. Peter Parish in Dorchester. 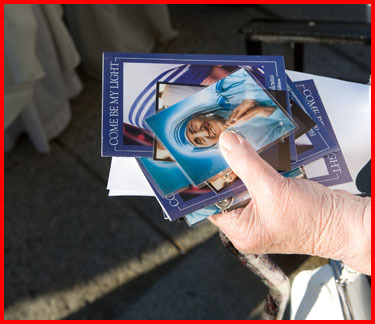 There was a very nice response of priests, religious and lay people from throughout the diocese. 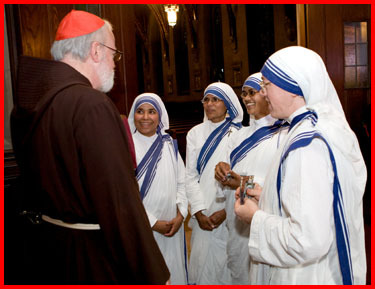 Many of them are associated with the Missionaries of Charity. 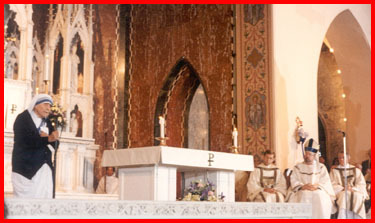 We celebrated the Mass for the feast day itself because the anniversary of her death is her liturgical feast day. 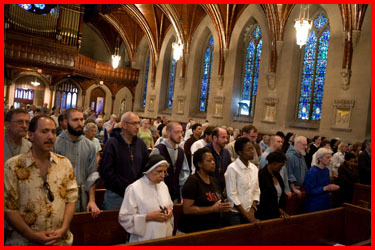 The readings were very beautiful and very meaningful; St. Paul’s reflection on charity and the Gospel of the Beatitudes were so appropriate for Mother Teresa. 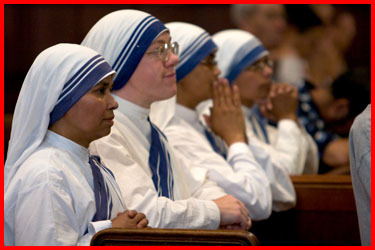 I asked the people in the church how many of them had actually met Mother Teresa, and many raised their hands. 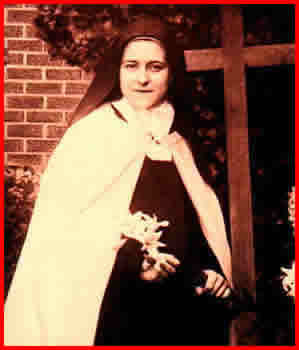 Then I said that when I was a child, I always thought it was so wonderful when I would see photographs of St. Therese the Little Flower because it was a sign that she had been a modern figure and lived in times when they had cameras to take her picture. 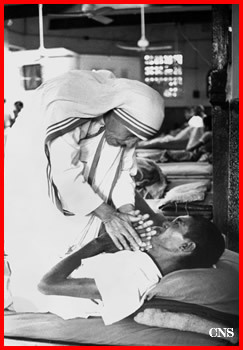 I said that with Mother Teresa it is even better because she was so close to us and lived in our times. 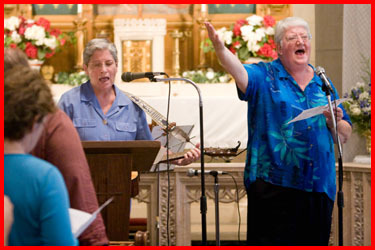 the year she began her work in the slums of Calcutta in India. I also explained my first encounter with Mother Teresa. 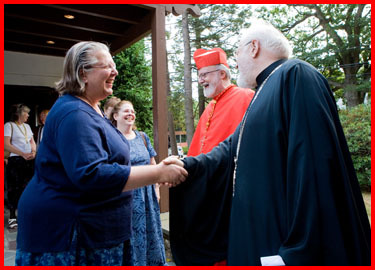 I was teaching at Catholic University, and the college decided to honor her. At the time she was not very well-known, so there were only about 30 people who went to the ceremony. Eileen Egan from Catholic Relief Services introduced Mother and described how she had met Mother Teresa on the streets of Calcutta. At her first encounter she saw this wheelbarrow with a dying man covered with maggots and filth coming down the street. It looked like the wheelbarrow was moving under its own power because she could not see that there was a little nun, Mother Teresa, on the other side pushing it. 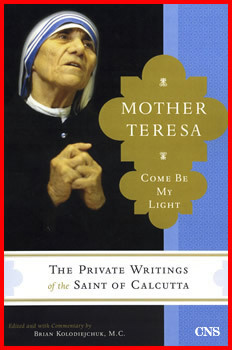 It was a year or so later that Malcolm Muggeridge, then head of the BBC, made his television program “Something Beautiful for God.” His encounter with Mother Teresa eventually lead to his own conversion to Catholicism, but I credit him with making her known to the world with that television story that later became a book. About 10 years later Mother was already so well-known that she was given the Nobel Peace Prize, which everyone remembers the very moving speech she gave on that day and how the money that they usually have to celebrate the banquet was given to feed the poor. That was so typical of her. I was very grateful to Mother. She sent me sisters when I was a bishop in the West Indies, and when I went to Fall River, I called her and asked her to send sisters there. She sent them right away. Eventually, she came to visit them there, and that was a very historic trip. She visited a number of spots in Boston at the same time and came to New Bedford. 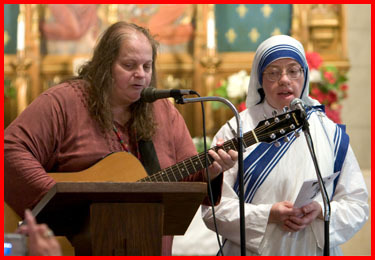 While she was in Boston she was at St. Elizabeth Medical Center in Brighton and visited some of the prisons. So, many people had the opportunity to see her. Her presence was always a great consolation to all the people. Time Magazine recently had a cover story about Mother Teresa, due to a book that was published recently of her letters and personal papers. In those papers, she talks about her spiritual struggles. Really, what she is describing for us is what the mystics call the dark night of the soul, the purification when all of the consolations and the sense of God’s presence is removed. One of her favorite phrases that she has in all of her chapels is, “I thirst” as Jesus cried on the cross. 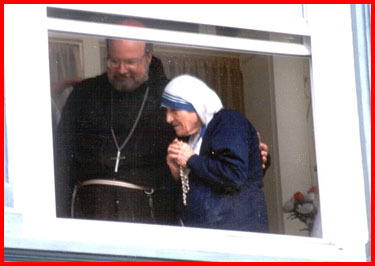 Jesus on the cross also cries out, “My God, my God, why have you abandoned Me?” He also experienced that abandonment on the cross, and that is the experience of Mother Teresa in her spiritual life. It was her spiritual crucifixion. It is certainly no indication of a lack of faith on her part, rather it shows how focused she was on her mission and on fulfilling God’s will even when she did not have any spiritual high to sustain her. 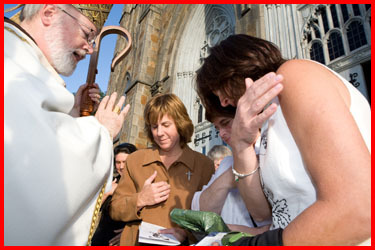 It was just pure faith, the desire to embrace the cross and to serve Christ in the poor and forgotten. For all of us she is an example of holiness, how to live the Beatitudes and to serve the Lord in the distressing disguise of poverty, disease and hunger. 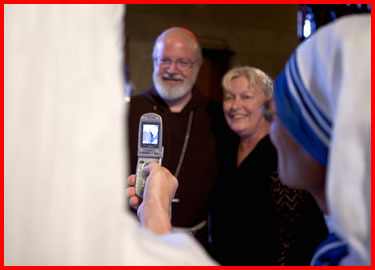 The sisters were even pressed into service to help take photos! Earlier in the week, priests around the archdiocese gathered at St. Brigid in South Boston for a picnic to mark Labor Day. It is the third year that the gathering is organized. 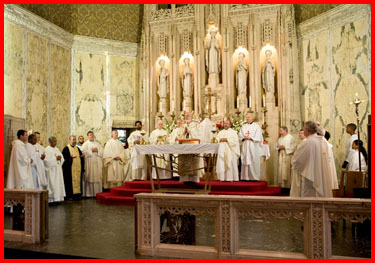 This past Monday we had probably 100 priests. 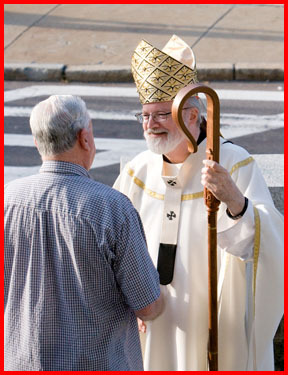 It was quite a cross-section from young priests to retired priests as well as priests from all the different regions of the archdiocese. 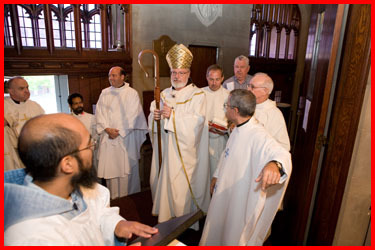 Events like this promote a spirit of priestly fraternity. Fr. Casey, Fr. Ben and Fr. Flynn with chef Richie Baressi and parish helpers. Each year, Father Casey is always very gracious in making the arrangements, and the weather for Labor Day this year was ideal for a picnic! Many families have picnics on this holiday that marks the end of the summer. 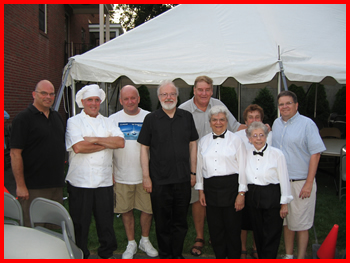 It was wonderful to bring together our priestly family to mark the end of the summer with the Labor Day picnic. 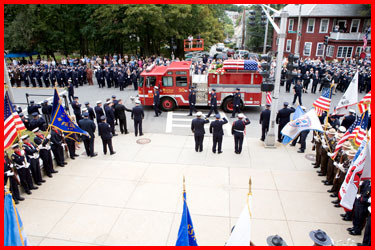 Last week, we had a very tragic incident in West Roxbury where a group of firefighters from Engine 30, Ladder 25 rushed into a building and the roof collapsed on them. 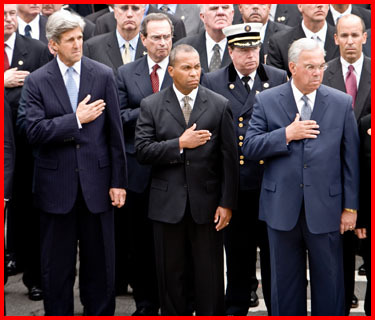 Several firefighters were injured and two lost their lives. 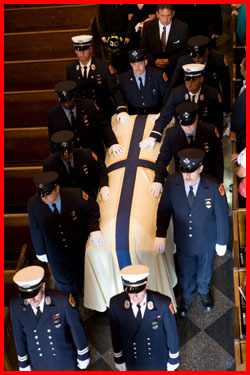 I visited the fire station last week because I had Mass nearby and made a point of stopping to see the firefighters. 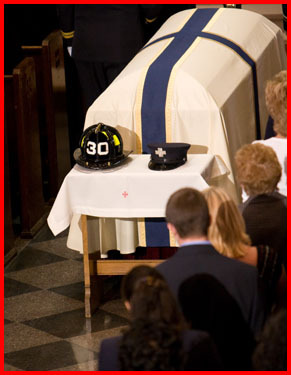 Then yesterday was the funeral for the first of the two firemen. 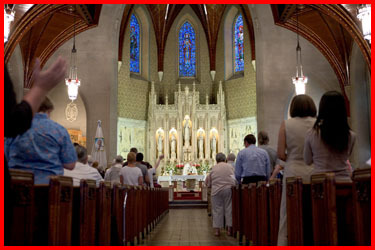 He was a Catholic and the Mass was at Holy Name Parish in West Roxbury. 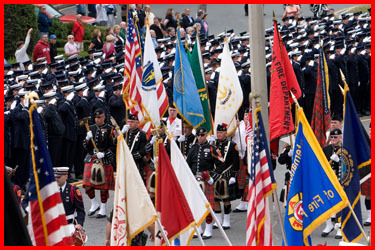 I am told that 20,000 firemen came from all over the United States and Canada to be a part of the ceremony. 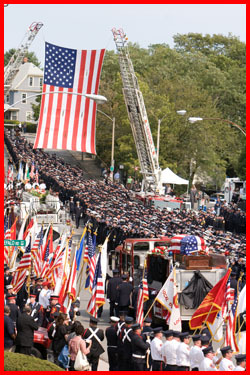 They carried the body in on a fire truck, hung a big flag from the ladders and there were many bagpipers there. 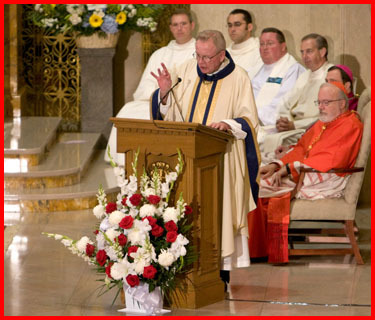 Father Dan Mahoney, who is very involved as the chaplain of the Fire Department, preached at the Mass, and there were many priests present who are also involved as chaplains of different fire departments. 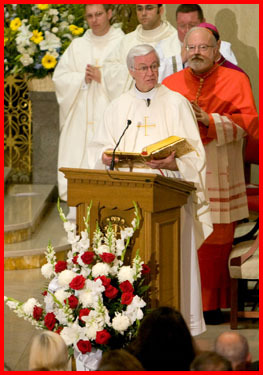 Father George Carlson, the parish’s pastor, did a very wonderful job orchestrating all of this. I was happy to be a part of the ceremony. I did the final commendation and made a few remarks of condolences. 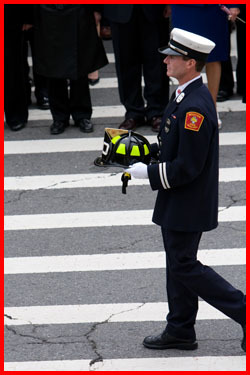 It was a very moving celebration, and I am sure very reassuring for the family left behind. 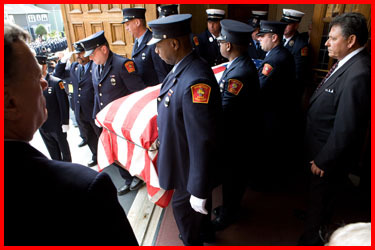 Firemen have such a dangerous job, and I am sure that every fireman’s family worries about their parent, spouse, sibling or other firefighter in their family who has to risk his or her life so frequently. I have heard that we have more fires than many parts of the country because of so many wooden structures and older buildings. 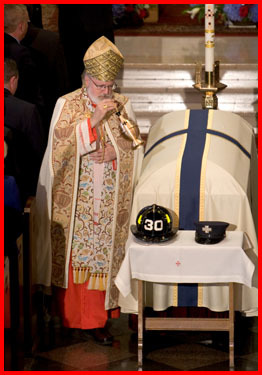 One of the firemen said, “We show up on the worst day in a person’s life and try to make it a little bit better by saving their home, saving their lives.” Jesus says in the Gospel, “No one has greater love than this, to lay down one’s life for one’s friends.” That is the kind of love that motivates firefighters to risk their lives to be able to help their neighbors, and we owe them a great debt of gratitude. 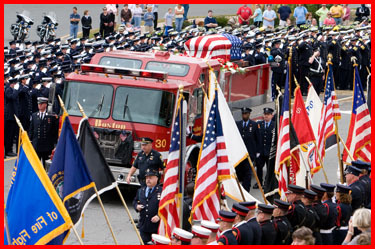 These ceremonies that surround the death of a firefighter who dies in action are an indication of the community’s awareness of what an important role they play. 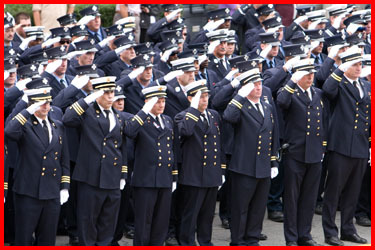 Certainly we are very, very grateful for the courage and generosity of the men and women of the Fire Department. 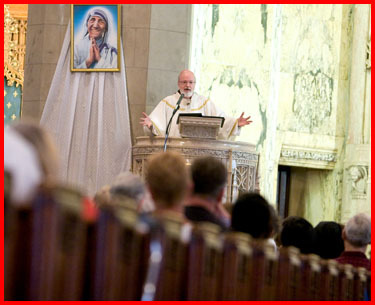 Later that day, there was a meeting of the Catholic and Orthodox pilgrims at the Greek Orthodox Metropolis of Boston. 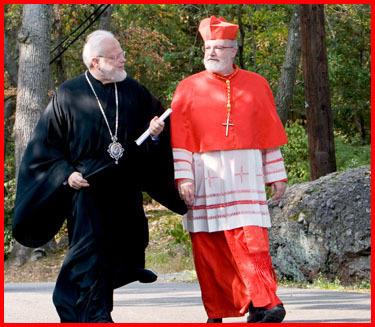 In a week, Metropolitan Methodios and I will be leading a pilgrimage to Rome, Constantinople and St. Petersburg. We had a prayer service. There was a scripture reading, and we reflected a little on the meaning of pilgrimage and the importance of this experience in our quest for unity between our two faith communities. 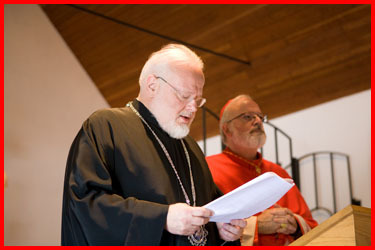 Finally for my photo of the week I have chosen this photo of Metropolitan Methodios jointly lighting a candle at Thursday’s prayer service as a sign of Christian unity. I follow with interest your wonderful blog as the mother of a child adopted from an orphanage in St. Petersburg, Russia. I humbly request that you keep these orphans of Russia in your prayers while you are there, and say a special prayer for the woman who chose life for my child. 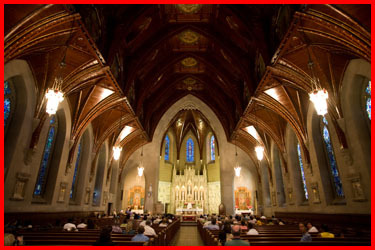 This blog is a great addition to the evangelical mission of the Church. Our Church needs more missionary-mindedness like this as we go into the future. As one very interested in Eastern Catholic and Eastern Orthodox Churches it has been good to read about the pilgrimage East and to Rome being taken by Eastern and Western Christians together. 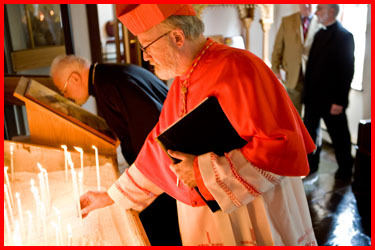 I have never seen a married Eastern Catholic or Eastern Orthodox priest referred to as a “permanent priest.” This is because there are many situations (like the death of one’s wife) that can change everything—including a call to a diffferent or “higher” order in the Church. Thanks for the post and all the wonderfull pictures. 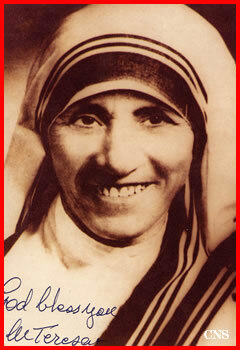 Mother Theresa lived a life that is a reminder to all of us about the value of life. 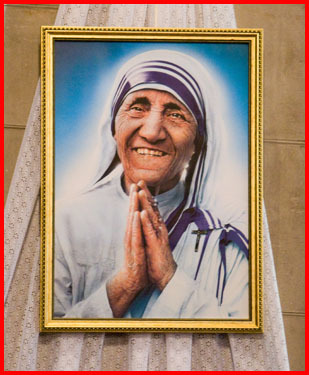 Anyway, I watched the commemoration of Mother Theresa in the BBC television channel just a few weeks ago. There were times in her life when she faced such great difficulties like many of us. As usual I enjoy your blog. Enjoy all that you write and the pictures tell so much. Calcutta. Only a Saint could keep it up year after year.